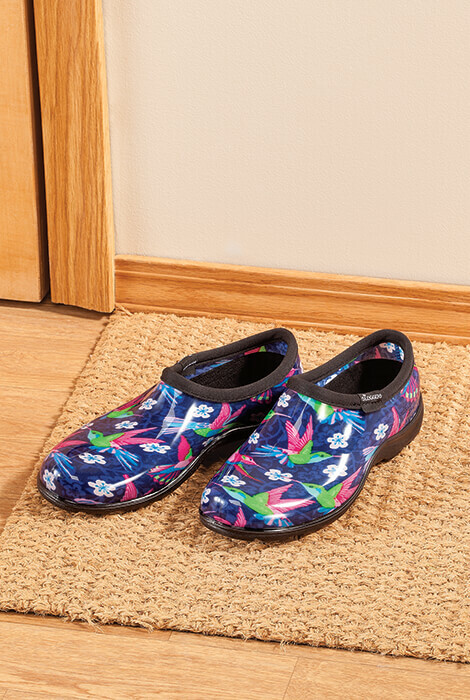 Waterproof, comfy and SO darn cute … you don't have to be a gardener to love these Sloggers Hummingbird Print Waterproof Garden Shoes! Featuring a bright, hummingbird print on a background of navy blue, Sloggers garden shoes are made of 100% recyclable medical-grade material with heavy-duty rubber lug tread soles for sure-stepping traction. Taking on wet grass, mud, dirt and puddles while you work in the garden, mow the lawn, wash the car or walk the dog, the insoles provide all-day comfort, and a soft biding around the top opening keeps ankles comfy. Fun, colorful Sloggers are easy to slip on and off. Simply hose them off to clean, and keep them handy at your backdoor because you'll wear them often! Available in whole sizes 7-10; for half sizes, order next size up.